Posh Home Box is a new home decor subscription box! Each month has a different theme for areas in your home, or entertaining, etc. FYI – I am still working on getting some December reviews up, (I’m behind), but it’s important to mention that this box arrived in December, before New Year’s Eve! This is the “Champagne and Velvet” box! Excellent packaging – everything arrived intact and it felt like unwrapping a gift! The Products: Home decor items great for keeping or gifting! Each box comes with a card detailing the items included, with tips on how to used them. Gold Dotted Champagne Flutes – Estimated Value $20? These glasses are gorgeous! Festive, special, and while they were great for the holidays/New Year’s, they’re perfect all year round, too. Gold Confetti Napkins – Estimated Value $5? While I don’t always go for matchy decor, I appreciate the gold confetti theme throughout this box. These napkins look great on our bar cart! This wine coaster is porcelain with gold accents. A champagne/wine coaster makes so much sense for any chilled wine – I will definitely use this a lot! If you are like me and find the suspense of opening a champagne bottle to be a bit scary, this tool takes care of that! Plus, again, it looks so classy on our bar! Velvet Bird – Estimated Value $10? House & Home magazine is one of my favorite reads on Texture, and I’m happy to get a physical copy to display on our coffee table! Verdict: I was really impressed with the quality of the products, the theme, and the curation of this box! My estimated value for this box is about $85.50 – fairly over the $69.90 shipped cost to the US. Like most home subscription boxes, there isn’t a significant value over the cost of the box, so I wouldn’t recommend this if you are only interested in high-value subscription boxes. Can you still get this box if you sign up today? No – but you can sign up for their February box. Coupon – There are no coupons at the moment. What do you think of Posh Home Box? This looks expensive for what you get. I’m an alcoholic, so get to stay away from any boxes alcohol related which helps narrow down my subscription box search. Seriously. $70 for glasses and some cocktail napkins. I think I could replicate everything and it would be completely to my taste for $30 at most. I find these high end home boxes to be inscrutable given that the kind of stuff in them can be picked up at any Marshall’s or Hime Goods for far less than the inflated stated retail value. The only good one I’ve seen is Sundae Home. I just signed up and hope to get this month’s box. It’s every other month. I really loved the past reviews. I’ve wanted a home goods box for SO LONG, does anyone have any good suggestions? These are living room or kitchen items aren’t they? I’m LOVING the look of this box!!! Well, except for the bird. That thing can fly away home. lol I wish shipping wasn’t so expensive to the US. Lol! Yea it’s so random right? Love real birds though. Your comment made me laugh! I’m a little thrown by the silver bird. Everything else is bubbly and gold. Makes it feel like an afterthought. While this box looked pretty good, the value isn’t there for me. 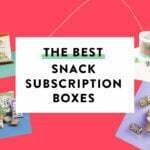 I expect that one or two items of every subscription box will not ‘be a fit’ for me. So I need the value to be higher to account for that. Will keep an eye on these reviews, though, in case the value is improved. December looks good!! January, bought for a gift, was not …. hope you review that one as well!! good review! The Popsugar cheers tray would go nice with these items! This is a lovely box! I will keep my eye on it.